The Bryan College Station Convention and Visitors Bureau is proud to announce the arrival of four new interns for the summer. All four interns are students at Texas A&M University. 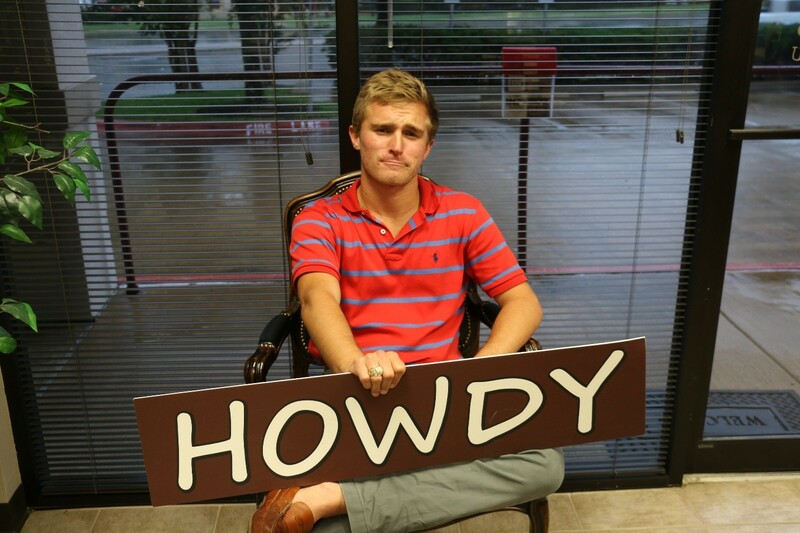 Throughout the month of June we will be reviving “Meet the Intern” blog series. 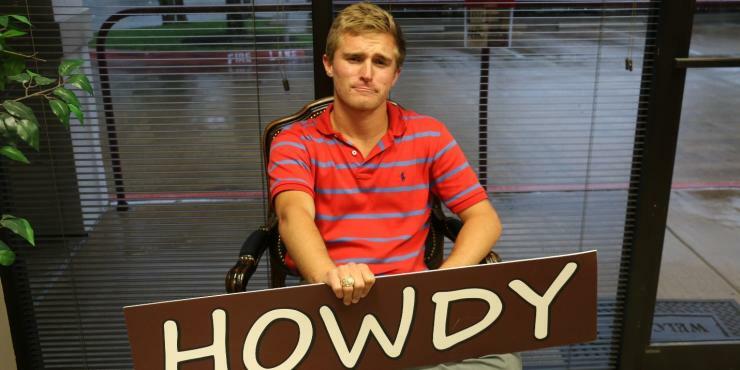 This week we have Hunter Legg, one of the summer interns for Bryan College Station Sports + Events. Born and raised in central Texas in a small town known as Temple. I lived here until I was about 11 years old and loved every minute of it. Approaching my middle school/junior high school days, I moved to the coastline of Texas to a city called LaPorte, where humidity and rain actually existed. I graduated from LaPorte High School in 2012 and shortly after embarked on my journey to becoming a Fightin’ Texas Aggie. Coming into Texas A&M I wanted to follow my childhood dream of becoming a vet. Getting further into my classes, drowning in school work and my studies, I started to realize this was only a dream and not a passion. So, my sophomore year I did some re-evaluating and looked at the things I truly loved the most. I found that “sports” and “people” were always of utmost priority, which is why I am a Sport Management major. This has been such a great and amazing journey and I am so glad that I made the change. I couldn’t imagine pursuing anything different. Why did you choose A&M? As a Legg, you are raised to breathe and eat Aggie. Growing up, my family was one of those die-hard Aggie families. I can honestly say that I think the only color that I ever liked as a kid was maroon. So I guess you could say I had a predetermined destiny. I don’t know if it was because I was just not interested in going somewhere else or that I truly was brainwashed. This journey at Texas A&M has been a once-in-a-lifetime opportunity to become the absolute best all-around man that I could ever envision myself being. What do you do for Bryan College Station Sports + Events? I am currently interning with BCS Sports + Events where I work hand-in-hand with the sports staff for the events this summer in the Bryan-College Station area. So far I’ve assisted in preparing for the summer tournaments, sponsorship and organizing a volunteer schedule. My favorite sports team… That is a hard question. I love all sports and never really rooted for only one team. One team that I will always root for no matter what is Team USA. I absolutely love watching the Olympics. My dream job today is working somewhere alongside the beach with a job pertaining to sports. I would love to work at the Olympic Training Center in California one day with a focus on Diversity and Inclusion with International Sport. What is your favorite thing about B/CS? What sets this town apart from all of the others is the constant kindness and generosity that each and every one of these citizens have for others. It is so humbling to know that this town truly does care about you. Whether you know them or not, you can bet that someone will always come to help out with a simple smile across their face and a “Howdy”. What’s the best restaurant in B/CS? My favorite restaurant in Bryan College Station would have to be Layne’s. Even though I am trying to make life decisions and eat healthier, I somehow keep finding Layne’s boxes in my trash can. It’s becoming a problem! Song you can’t stop listening to right now? The song that I will forever and always love is “Latch” by Sam Smith and Disclosure. I don’t think I will ever find a song that will overpower this mind-blowing song. This will be the only time you would find me singing at the top of my lungs no matter how embarrassing it may look. ‘Latch’ has that effect to just take control and won’t let you let it go.